Thursday night, my dad and I went to see Murray Parahia in Page Auditorium, at Duke. The pianist's concert consisted exclusively of works by Beethoven, Bach, Schumann and Chopin. I enjoyed it a great deal. I need to get more recordings of Beethoven piano sonatas, because I believe I only have three of them. Friday, I went to the Visualization Forum and saw OLA give a talk on visualizing code. That was awesome. It was like being in college again, except I got to eat while I was listening. He is just hilarious and I think the audience really had a good time. My brother, KR, and DC arrived late that night, but not long after they got there, KR started telling me about the Fujitsu P1610 and the OQO model 02. They are adorable. I need one of each. Not really. 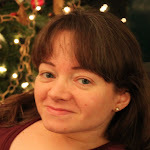 I started thinking of various fanciful scenarios of ditching my treo and my current laptop and dreaming of having a real itty-bitty computer with me at all times and a real phone that you can actually hear people talk on. The warranty on the laptop that I use is about to expire and I need to switch cell phone carriers, so it's not completely crazy. On Saturday, my dad and I made crepe pancakes and DC became thoroughly engrossed in my Geomag collection. Early that evening, we went to A&M Grill for dinner. I still think the food there is just ok at best, but KR wanted to show off a representation of North Carolina barbecue. The sauce and the cole slaw are just too sour for my taste. I tried a spoonful of their brunswick stew and I'll probably have that next time, if I remember. Sunday, we went to Eastern Lights and it was almost as if having KR along was like bringing a celebrity. When a family has been going to an incarnation of the same restaurant for 25 years, the owners and staff are very happy when a kid comes home to visit. KR wanted to show off Duke's campus to DC. I figured that it made sense to check out the new French Family Science Center while we were there. It's pretty impressive and it makes the Levine Science Research Center look old and boring in comparison. I guess that's the result I would expect from a donation from the Gates Foundation. That night, we went to ACME Food & Beverage Co., which lived up to its superbness. 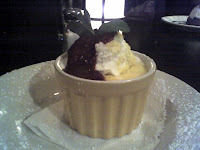 I had another duck confit empanada and shared another serving of warm lemon pudding cake with raspberry sauce. I could eat warm lemon pudding cake every single day for years. Monday, we went to the Original Q-Shack and it was hard seeing the Thai Cafe from across the street, just wishing I could have some Thai Cafe baskets and some Thai Iced Tea. 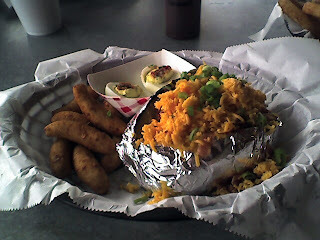 I had a baked potato with "all the fixins". With butter, sour cream, chives and bacon, it's really good but way too greasy compared to what I'm used to eating these days. I like their hushpuppies. I tried their jalapeño deviled eggs and they weren't as exciting as I'd hoped, but they weren't overly hot either, which was good. It was nice going to a place like that at lunch time, so I could have a nice quantity of sweet tea without its keeping me awake. The weather was perfect, so we got to eat outside, too. I'll try to make this quick, because I want to finish loading the dishwasher. Last night, I volunteered for UNC-TV by answering phones, taking pledges and eating food. I coordinated the library's volunteer effort with a few good spams. I had a good time and got to see JE! That was exciting, indeed. She showed me several pictures of her cats. It was also nice to meet the people from other areas of Duke, with whom I coordinated the logistics. The programming wasn't too exciting, so we didn't get a tremendous number of calls. They've continued to improve the technology, so I was actually able to hear every single one of the people I did talk to. Last time when I volunteered it was pouring rain, so I was also very thankful that I didn't get soaked this year. Today the weather was beautiful, so I had a very nice time during my lunch hour getting more Pauly Dogs veggie dogs. I did that yesterday, too, actually, but the weather was nicer today so my inhalation was more leisurely. Tonight my parents and I went to Taverna Nikos for dinner. 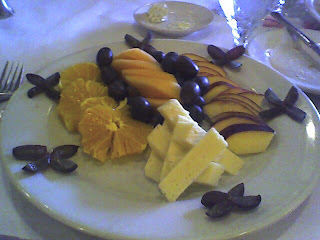 I had the fruit and cheese platter, which was very good. I've been joining the masses and checking out Twitter this week. It's basically broadcast IM, which has enormous potential. It reminds me of zephyr classes, but on a massive scale. I'm sure it would be more fun if I actually knew some people on there, so let me know if any of you use it. It's been very slow with all of its publicity this week, so if you do check it out, you may need to be patient. I believe they are working on beefing it up so it can keep up with the traffic. You can also take a look at a neat Twitter / Google Maps mashup called Twittervision. Scrap the dishwasher idea. It's time to sleep. Yesterday, I was talking to my mom in the great room, shortly before I was going to a get a haircut. I spotted a pileated woodpecker through the windows. We both managed to get some good shots of him. Last night, I had an early dinner at Madhatter's Cafe & Bake Shop with AE, JB, and LB. EG's flight was delayed, so she couldn't join us. We had a great time chatting and then we went to Whole Foods briefly. That didn't take long, so AE and I decided to check out the new theater at Northgate Mall. Neither of us had been to that mall in years. We spent a long time figuring out the optimal parking spot, since we weren't shooting for a particular movie time. Even though it's been extensively renovated, it's still an old mall, so it wasn't easy finding a space that would work that well with my van that had a curb cut anywhere nearby. We did find a good space, though. By the time we actually got to the theater, it was about 7:45pm and we would have either had to have gone into a movie late or wait almost an hour. There wasn't anything that we were that eager to see, so we decided to wander around the mall some. Eventually, we went in Hungates. Hungates used to be the only store in Durham where you could buy art supplies. AE noticed that there was a whole display of colored pencils wrapped up and marked down to $200. There were over 900 Berol Prismacolor pencils, which normally sell for just under a $1 a pencil. I thought that was just incredible. They are my favorite brand of colored pencils and are almost the consistency of very smooth, but hard, crayons in wood pencils. Even though I haven't produced a major piece of artwork in 8 years, I knew I had to get them. It's not as if they will go bad or anything. Apparently Hungates has been hit very hard by large chain art supply stores, such as Michael's and A.C. Moore, so they are getting out of the art supply business all together. Vic, the very nice salesperson that explained this, said we could drive behind the store and pick them up. Very little is marked back behind the mall, but we knew we were supposed to see the Durham police substation and two dumpsters. I parked and AE called Vic on the phone, to let him know that we had found the dumpsters. We waited. We waited a good 15 minutes. 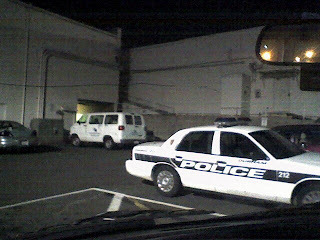 We were very entertained at the idea of waiting behind a mall, in a large white van, waiting for a guy named Vic to deliver our large package of...colored pencils. There was one problem. They were the wrong dumpsters. AE called again and we found out that we needed to keep going around the mall. We found Vic and they loaded the pencils into the backseat. We were on our way. I actually found a place in my art studio for them, which is perfect. Tonight my parents and I went to ACME (to celebrate the pencil acquisition, of course). 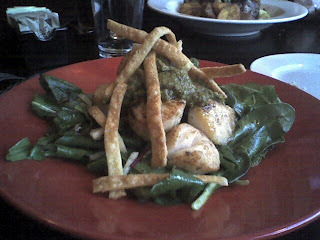 I had another serving of pan seared scallops with cashew-ginger pesto, baby arugula and grapefruit. We shared a lemon pudding cake for dessert. That's one of my favorites. As of this morning, I was #1 out of 16 in the library basketball pool! I must point out that no money is involved in this contest. I think it's just bragging rights and I need to be bragging while I can, because this won't last. Despite my intention of not predicting any upsets in the first round, I did accurately pick the Winthrop upset. It was an accident, actually, because I was filling out my picks so quickly. Go Winthrop! We went to the Flying Fish tonight and sat next to the window. 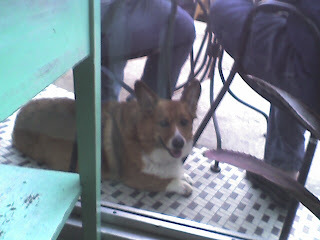 My parents and I were thoroughly entertained by Donald, a corgie, who was vacuuming French fries from underneath all the outdoor seating. I got to meet him as I leaving and he was very sweet. I then immediately ran into my builder for the first time in almost three years and got to tell him that I still love my house. 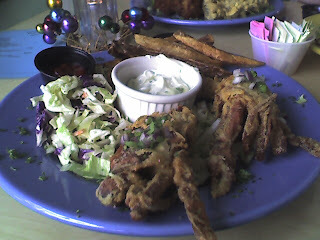 They had fried soft shell crabs as the special tonight and they were very good. The tartar sauce was not necessary. The NCCA tournament is underway. I'm going to make an attempt not to even look at the bracket that I entered into the library pool, because I always enjoy it a lot more when I base my cheering on how I like each team rather than my predictions. I did, however, break my tradition and not pick any upsets for the first round. So far so good. Today I went to my weekly meeting at the American Tobacco Campus, but I came back to West Campus for lunch. AE wanted to show her friend, DS (many name collisions on these intials lately- I leave distinguishing them as a hopeless exercise for the reader) around Duke. As I mentioned previously, there isn't a lot on campus that is open this week, so we met at Twinnie's. We then carried our stuff back up the hill and ate on the library patio. The weather was perfect. My parents and I ate at Thai Cafe tonight. It's the time of year when I need to convince restaurants that donating gift certificates to be used as door prizes for the CIT Showcase is good advertising. It is! When I got home, my Think Outside Stowaway Bluetooth Keyboard was waiting for me. That was very exciting. So far, I am extremely pleased with it. It's lightweight and compact. I downloaded the Treo 650 driver and then I was ready to go. Configuring the secure connection was a little tricky, because I was finally watching the second half of West Side Story and not paying attention to the instructions closely enough. It's a little tricky anyway, because you have to keep putting the keyboard in discovery mode while configuring the passkeys. It is very cool, though. I like the idea of having something that should also work with whatever tablet or phone I get in the future, too, since it uses bluetooth. Those of you who are regular readers may recognize one or more of the photos above. I just wanted to show you all what a particular area on Duke's campus looked almost exactly a year ago and what it looks like today. This has caused me to rant ad nauseam and now I will rant again here. Daffodils bloom EVERY YEAR. The perennials that used to be planted there continue to be happy and bloom EVERY YEAR. I shudder to think what has happen to all the poor forsaken plants and bulbs that were there. It looks as if they are putting in some sort of irrigation system, but that is no excuse. It just annoys me to no end to see money wasted and that's exactly what happened if they were thrown out. You can see more photos of what this area looked like with perennials planted here as well as some other plantings on campus here. I opened my eyes and realized it was my pager that was buzzing. That meant it was after 8am. NOOooooooo! Normally I get up at least an hour before that. Normally my alarm is set to go off at 6:23am. I had forgotten to set it the night before. I've forgotten before, but I generally wake up around the right time anyway. It turned out ok, because I didn't have any early meetings. I called NC and I ended up not being more than about 20-25 minutes minutes later than usual. I was embarrassed, though. I did, however, feel rested. Guitar practice had been moved from Friday to last night, because of the ACC basketball tournament. Most people had other things they needed to do afterwards, so MP and I went out to dinner. We decided on Blue Corn and then determined that they were closed, based on the fact that the restaurant was empty and there were upside-down chairs on the tables. Fortunately, we only had to deduce this by staring for a few minutes from the parking lot. After much discussion, we decided on either Parizade or Verde. Our decision was then made for us, because Verde was also closed. We had a lovely dinner. 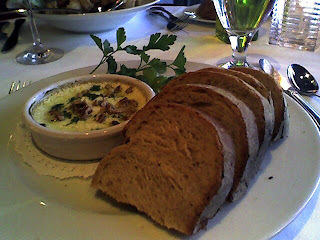 I had baked goat cheese with very good bread and a Parizade salad. 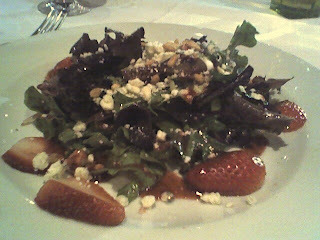 Parizade salads have lettuce, feta, strawberries, toasted pine nuts and a raspberry vinaigrette. It's a wonderful combination. I had a cup of decaf coffee for dessert and MP tried their butterscotch creme brulee. Then I drove MP to EB's, so she could get her car. Heading back, I missed a turn and got lost. I've gotten to the point that I almost enjoy getting lost if there are no time constraints, because it's almost like a puzzle to figure out. I, however, prefer not to do it at 11pm when I have to get up the next morning. I wasn't lost long, though, and found a different I-40 West On-ramp from the one I'd originally planned to use. It was a beautiful day today. I had lunch on the the library patio and ate the crab dip and crackers that CL gave me on Saturday. Then I wandered over to the Bryan Center Walkyway with the hope that the on-line schedule was wrong and that the Keva Juice stand was really open. It wasn't. It's spring break at Duke this week, so almost everything is closed. I ended up getting some fresh squeezed orange juice from Alpine. I then headed back to the library. I stopped to drink more right in front of the old Perkins Library entrance, giving the juice the opportunity to spontaneously squirt down my shirt. NP came out of the building just at that moment and pointed out that people were going to accuse me of having a drinking problem. Again, it's been gorgeous here. March and April are my two favorite months of the year, because the weather is usually lovely, the flowers bloom and then the leaves start to come out. Tuesday, I had lunch with NP at the Refectory. I had delicious chicken and dumplings, sans dumplings. I guess they got away. That was perfectly ok with me, though, because I got extra rice. That evening, I celebrated JA's birthday with him and our friends (JJ, HB, JM, DS, AP, AY, and GMc) at Tyler's, at the American Tobacco Campus. I discovered that Tyler's has excellent (extremely tart) lemonade. We shared wings, calamari, pickle chips, nachos and French fries.Tyler As expected, we had a great time. The next day, I was back at the tobacco campus for my weekly meeting at OIT and had lunch at the Mellow Mushroom with AE and M. For some strange reason, I hadn't noticed that they sold pizza by the slice before. Spinach, tomatoes and feta was a nice combination. Thursday, LA brought Gizmo Monkeybear Batrabbit over so all of the dog lovers within CIT could meet him. He's AT's dachsund pekingese mix puppy. He's adorable and his tongue is out of control. Friday, AN, SM and I went to the Visualization Forum, which was an interesting program, given by David Kidd, from the National Evolutionary Synethesis Center, on Visualizing Evolution. He focused primarily on 3D phylogenetic trees, which were cool. Later in the afternoon, AN, NC and I took a field trip down to the Duke Computer Store and checked out the latest tablet PCs. They had the new Lenovo X60 with the touch screen that allows you to either use your finger or a stylus. More exciting to me were the Sony Vaio UX series tablet PCs. They are about the size of a paperback novel, have 1GB of memory, a 1.33Ghz processor, WAN, Cingular cellular access and a 40 GB harddrive. It has a slide-out keyboard, which looks somewhat easier to use than a Treo keyboard, but would have similar issues. I was certainly smitten. It's so portable and is really impressive considering that it's so small, but its computing power is almost as good as the machine I'm using now. That said, one would probably have to have an additional monitor and keyboard to make it practical for everyday use. It's possible that it might be a good Treo replacement, which would mean also carrying a real phone that actually works well as a phone (a novel idea). I don't think I'm going to get one, but on Amazon I saw a strong recommendation for a portable bluetooth keyboard, Think Outside Stowaway Bluetooth Keyboard for PDA, which would work with a tablet PC, a PDA, or with my Treo 650. I decided to order one and give it a try. I take a lot of minutes at meetings and I don't like hauling a heavy laptop around, so I'm betting it will be extremely useful. That night I met AE at Nosh and we shared another SRB pizza with chicken. We take basketball very seriously in this area and it's very obvious. We had cable installed in a conference room just for the ACC tournament. So, anytime you want to see what's going on, you can look through the room's windows and check it out on the projection system. Library HR had a bracket contest and I got everything wrong except for UNC's wins. That was amusingly pathetic. I, however, am temporarily a rabid State fan, because I think it's exciting that they are doing well, despite their having knocked Duke out of the tournament. I would love to see them beat UNC tomorrow. Today I went over to CL and JL's house for an ACC tournament party. We watched the two semi-final games while eating wings, brie and crab dip. It was nice getting to meet KC and CC's baby son and the rest of their family. I experienced another example of good intentions not going so well. I brought over a four-pack of random cold sodas and on the drive over, they decided to leap out of the cartoon, out of the basket I keep on my backseat, and hide between the back seat and the side of the van. One of the bottles actually opened! It was the blueberry one, of course. lattes to me and beer to everyone else. Saturday night, I was within the Cary city limits twice and only had to turn around once. I made the mistake, yet again, of looking up the address on a map before I left, so I was looking for a street that was actually an unlabeled entrance to the shopping center. Fortunately, I was pretty sure that one of the shopping centers was a likely candidate, so I just had to turn around once I was past it. The destination was Japan Express, where I met CL and JL for dinner. The food is pretty much identical the food at the one on Hillsborough Road, in Durham, which means it was good, fast and cheap. I had the hibachi shrimp. From there, CL and I took off for the RBC Center to see Billy Joel in concert. Once we got to the the Edwards Mill exit, the one that normally leads to the arena, we saw a sign that said "All Concert Traffic - Take Blue Ridge Exit". Uh oh. Well, we had 50 minutes to get there. It was only the next exit. We were only only driving at .00008 mph. Pretty soon I was saying that I hoped that we got there only an hour after the concert was supposed to start. The whole thing was just a mess. Fortunately, CL is about as calm as I am in such situations, so she was a good person to have along. We also were in a great spot to view the total lunar eclipse, which was a bonus. Needless to say, we were still annoyed. Once we got there, we still had the challenge of finding a parking spot. There are advantages to going there with an avid soccer player who can get out and run like lightning in order to find a space. She was able to talk someone into letting us park in the VIP parking, with all the stretch limos. Finally, we got inside! We were only a half hour late. Fortunately, it sounded from what Billy said as if he hadn't played too many songs yet, because he knew that the majority of the audience was late and still arriving. It was a great concert. His voice has not obviously deteriorated over the years and his piano playing ability is just incredible. It's like seeing a concert pianist perform. Ok, perhaps most concert pianists don't play their pianos by sitting on them, but they are usually almost as skilled as he is. He's skilled at twirling a microphone stand in the air like a baton, too. Of course, he teased the audience until he played Piano Man at the very end. I drove CL home to Cary and then made it back to I-40 by making five correct turns. If you don't know me, this will not seem like such a big deal. If you do know me and know that I'm scatterbrained all the time anyway, but even much more so if I'm driving, you should probably make sure that you aren't letting in any flies. I just have the uncanny ability to have a pretty good idea of where I am at all times, but still not know in which direction I should be going.